PT Kimia Farma (Persero) Tbk - Kimia Farma is a leading state-owned pharmaceutical company in Indonesia. Kimia Farma has its business activities focused in integrated pharmaceutical industry. Its business include manufacturing, pharmaceutical trade and distribution, retail pharmacy, health clinic, laboratories and optical clinics. 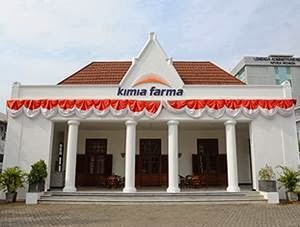 Kimia Farma is a public-listed company which is majority owned by the Government of Indonesia. Kimia Farma is listed on the Indonesia Stock Exchange (IDX) under reference code KAEF. At present, the Government of Indonesia holds 90.025% shares in Kimia Farma which represented by the Minister of State-Owned Enterprises (SOE). Other 0.127% by management/employee and 9.848% by public. Headquartered in Jakarta, Kimia Farma now has 7 production facilities; Plant Jakarta, Plant Bandung, Plant Semarang, Plant Watudakon, Plant Garam Farmasi, Plant Medan, and lant Rapid Test. Kimia Farma also supported by 1 research and development office at Bandung and 1 central logistic unit Jakarta. Kimia Farma also supported 6 directly-owned subsidiaries and affiliated companies, namely PT Kimia Farma Trading & Distribution, PT Kimia Farma Apotek, PT Sinkona Indonesia Lestari, PT Kimia Farma Diagnostik, PT Kimia Farma Sungwun Pharmacopia and PT Asuransi InHealth Indonesia. As of the end of September 2018, Kimia Farma has 1,135 pharmacies, 530 health clinics, 55 clinical laboratories, and 10 optics throughout Indonesia. JobsCDC.com now available on android device. Download now on Google Play here. Please be aware of recruitment fraud. The entire stage of this selection process is free of charge. 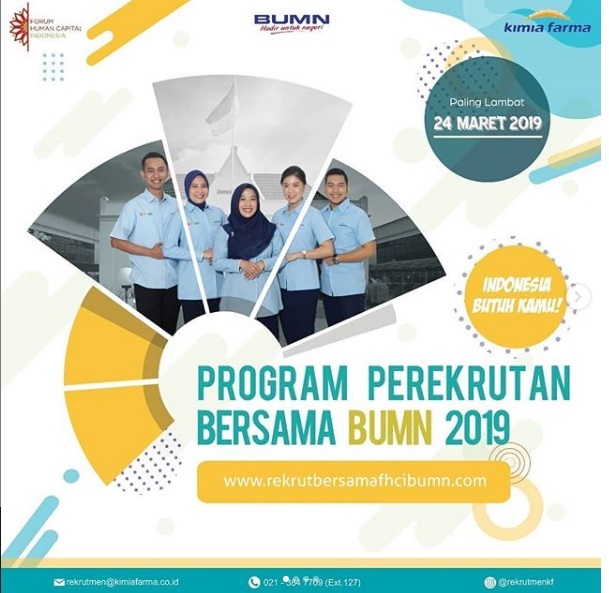 PT Kimia Farma (Persero) Tbk - Program Perekrutan Bersama PPB BUMN Kimia Farma March 2019 will never ask for fees or upfront payments for any purposes during the recruitment process such as transportation and accommodation.